• Each Bill is Handsomely Showcased in Special Gold Foil Museum-Quality Collectible Folio. Includes Genuine Legal Tender Authentic Elvis $2 Bill. Special Gold Foil Museum-Quality Folio. Built-in Manufacturer's Certificate of Authenticity. Measures 10.5" x 8.5 (closed) and 10.5” x17” (open). 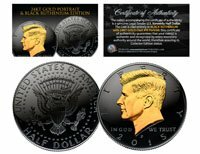 Limited Edition & Individually Serial Numbered of 25,000. Includes an Officially Licensed Elvis “Signature” Product Hologram Seal. Features Elvis Official 75th Birthday Logo. Made in USA. Officially Licensed Historical Elvis Collectible! Don’t Miss Your Chance to Order…Very Limited Quantity Available!